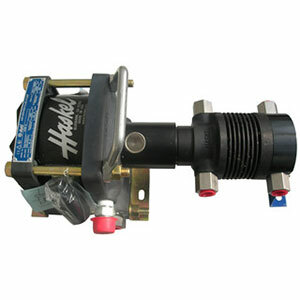 Haskel Refrigerant Pumps | FLW, Inc.
For use with R-11, R-12, R-22, R-114, R-134A, R-500, R-502 refrigerants. Pump the liquid first...then the vapor...then vacuum to 23"-27" HG with one pump. Positive displacement, two stage with plenty of "leverage" to condense the common refrigerant without a condenser. No heat generated during liquid transfer. Minor warming during vapor transfer. No refrigerant heating from the motor. Pneumatically driven. Operates from an air hose like an air tool. No electrical hazard. Each model is an integral pump with linear air motor assembly weighing from 13 to 24 lbs. No lubrication required. Nothing is added to the refrigerant, liquid or vapor. 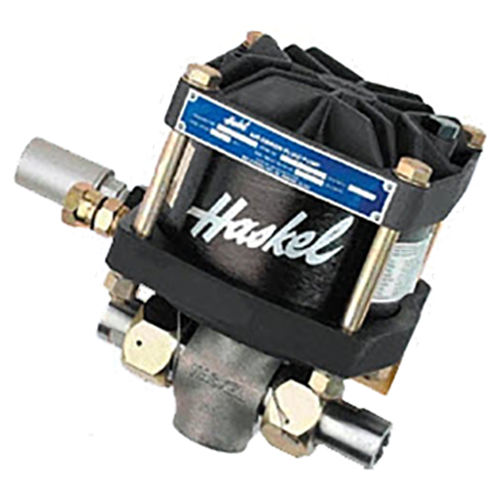 FLW proudly carries a large inventory of Haskel product. In addition, we have Haskel product specialists and engineers with application engineering expertise that you won't find anywhere else. Not to mention we repair most standard Haskel pumps and boosters. We can help size an amplifier, rebuild a pump, or engineer a custom pressure system. Please note that the misapplication of these products can cause very serious damage to person and/or property. We will gladly assist with application questions, but advise that the ultimate application of these products is the responsibility of the user. We will not accept liability for damages caused by the misapplication of the products built by Haskel. We also can not guarantee material compatibility. The materials used are detailed for your convenience, but you will have to decide as to the ultimate compatibility. FLW, INC EXPRESSLY DISCLAIMS ALL WARRANTIES, EXPRESSED OR IMPLIED, INCLUDING BUT NOT LIMITED TO IMPLIED WARRANTIES OF MERCHANTABILITY AND FITNESS FOR ANY PARTICULAR PURPOSE. IN NO EVENT SHALL FLW, INC BE LIABLE FOR ANY INJURY, EXPENSES, PROFITS, LOSS OR DAMAGE, DIRECT, INCIDENTAL, OR CONSEQUENTIAL, OR ANY OTHER PECUNIARY LOSS ARISING OUT OF THE USE OR INABILITY TO USE ANY PRODUCT DESCRIBED ON THIS WEB SITE. If you have any questions that may involve the proper use of these products, please contact us before proceeding. Although the ultimate responsibility is yours, we are pleased to assist and answer specific questions.